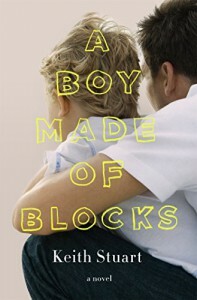 Set in contemporary Bristol and narrated in a first-person voice reminiscent of Nick Hornby, A Boy Made Of Blocks is the story of Alex, twenty-something father of autistic eight-year-old, Sam. As the story opens, Alex's marriage is collapsing due to his complete inability to relate to Sam, or to his wife, Jody. Alex's problems are long-standing, reaching back to the death of his older brother in a car accident outside his primary school gates. The trauma of that event has left him unable to express himself emotionally or to face up to the enormous problems confronting him both as a husband and as a father. Alex's salvation, and his way of finally beginning to communicate with his son, is the computer game, Minecraft. By joining Sam in his virtual world of buildings constructed from blocks, Alex finds a way to break through the barriers in is own life as well as in Sam's. Sincere, emotional and often very amusing, A Boy Made Of Blocks nevertheless has its weaknesses. In particular, it is often repetitive and the plot, with its stock characters, like the friend whose marriage seems to be so perfect but who turns out to be addicted to online gambling, feels a little bit as if it, too, has been constructed from blocks. Less about an autistic boy and more the story of an emotionally immature man - territory that has already been well-mined - this is an entertaining and sometimes insightful read but by no means a revelation.